Adam Equipment PGL balances combine the solid construction and fundamental features of a high-precision top loader with the simple operation of a portable balance. 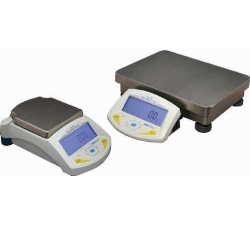 Great for weighing, parts counting, percentage weighing, check weighing and more. RS-232 bi-directional interface. No longer available. NO LONGER AVAILABLE. PGL balances combine the solid construction and fundamental features of a high-precision top loader with the simple operation of a portable balance. PGL 203 ............ 200g x 0.001g ..................... 5.7 x 4.9"
PGL 303 ............ 300g x 0.001g ..................... 5.7 x 4.9"
PGL 2002 .......... 2000g x 0.01g ..................... 7.6 x 7.6"
PGL 3002 .......... 3000g x 0.01g ..................... 7.6 x 7.6"
PGL 4001 .......... 4000g x 0.1g ....................... 7.6 x 7.6"
PGL 6001 .......... 6000g x 0.1g ....................... 7.6 x 7.6"
PGL 8001 .......... 8000g x 0.1g ....................... 7.6 x 7.6"
PGL 10001 ........ 10kg x 0.1g ........................ 15.7 x 11.8"
PGL 12001 ........ 12kg x 0.1g ......................... 7.6 x 7.6"
PGL 15001 ........ 15kg x 0.1g ......................... 7.6 x 7.6"
PGL 20001 ........ 20kg x 0.1g ......................... 15.7 x 11.8"
PGL 30001 ........ 30kg x 0.1g ......................... 15.7 x 11.8"